Learn about trends in the Janitorial Services business and where to find more info about how to open your own Janitorial Services business. Don’t forget you can receive free or low-cost training and free professional business advice, from your local Small Business Development Center! Get a free Janitorial Services business plan template on our Business Plans page. This Janitorial Services industry summary is from First Research which also sells a full version of this report. Companies in this industry clean building interiors, windows, carpets, and upholstery. Major US companies include divisions of companies such as ABM Industries and ServiceMaster, as well as Coverall Health-Based Cleaning System, Jani-King, and Stanley Steemer. Globally, janitorial and carpet cleaning services companies are more common in industrialized countries. Demand for commercial janitorial services is dependent on extensive infrastructure, while demand for carpet cleaning services relies on a large population of middle class customers. The industry is heavily concentrated in Australia, Canada, Japan, the US, and countries in Western Europe. But demand is growing in developing countries like China and India. The US janitorial services and carpet cleaning industry consists of about 55,000 janitorial establishments (single-location companies and units of multi-location companies) and about 8,000 carpet and upholstery cleaning establishments with combined annual revenue of about $40 billion. Commercial real estate occupancy drives demand for cleaning services. The profitability of individual companies depends on good marketing. Large companies have an advantage in serving customers with multiple locations. Small companies can compete effectively in local markets, especially for small business and residential customers. The US janitorial services industry is fragmented: the 50 largest companies generate about 30 percent of revenue. This Janitorial Services business market research report summary is from IBISWorld which also sells a full version of this report. The primary markets for the Janitorial Services business are commercial, industrial and government entities that contract with operators to clean their facilities. As a result of the Great Recession, demand from these clients fell as corporate profits diminished and office vacancy rates increased. In 2010, the industry began to rebound and has grown steadily, with revenues reaching $52.1 billion in the five years to 2014. The Janitorial Services industry will continue to improve with economic conditions lifting demand from businesses and households. Over the five years to 2019, revenues are projected to grow at an annual rate of 2.1% to $57.7 billion. In particular, educational and medical institutions will provide growth opportunities to industry operators as they continue a trend of outsourcing cleaning activities. Further, increases in construction activity and declines in unemployment will bolster revenues from households. Here is a Janitorial Services Business labor market summary from the Bureau of Labor Statistics. The median hourly wage for janitors and building cleaners was $10.73 in May 2012. The median wage is the wage at which half the workers in an occupation earned more than the amount and half earned less. The lowest 10 percent earned less than $8.08 per hour, and the top 10 percent earned more than $18.17 per hour. Janitors and building cleaners held about 2.3 million jobs in 2012. About 34 percent were employed in the services to buildings and dwellings industry, and another 14 percent were employed in elementary and secondary schools. The remainder was employed throughout all other industries. 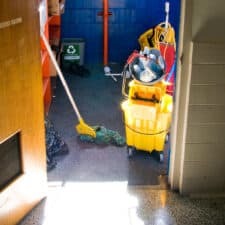 Most janitors and building cleaners work indoors, but some work outdoors part of the time, sweeping walkways, mowing lawns, and shoveling snow. They spend most of the day walking, standing, or bending while cleaning; and sometimes they must move or lift heavy supplies and equipment. As a result, the work may be strenuous on the back, arms, and legs. Some tasks, such as cleaning restrooms and trash areas, can be dirty and unpleasant. Employment of janitors and building cleaners is projected to grow 12 percent from 2012 to 2022, about as fast as the average for all occupations. Many new jobs are expected in facilities related to health care, as this industry is expected to grow rapidly.